OnePaintball, Paintball Blog - News & Facts rund um Paintball & Gotcha: PaintballX3 (Juli 2011) Epic Oklahoma D-Day Issue Live And FREE! PaintballX3 (Juli 2011) Epic Oklahoma D-Day Issue Live And FREE! 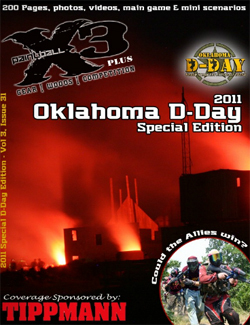 The 2011 Oklahoma D-Day Special Edition digital issue of PaintballX3 magazine, presented by TippmanSports, is live and absolutely, positively free here. Featuring massive, exclusive, in-depth coverage of the unbelievable Oklahoma D-Day event with photo spreads, videos, event coverage and player perspectives, the newest issue of PaintballX3 Magazine is a remarkable inside look at the most incredible paintball event in the USA! Click the READ MORE to see what's in the issue. - And of Course, Much, Much More! Absolutely free and full of news, reviews, coverage, the very best photography in paintball and some of the best writers in the business, the 2011 Oklahoma D-Day Special Edition digital issue of PaintballX3 Magazine, brought to you by Tippmann Sports, is ready for reading at www.PaintballX3.com!